hours: lunch 11:30am to 2pm, dinner 6pm to 9pm. Closed Sundays and first Monday every month. One of the great perks about this blog is that my friends are always saying, "Oh, I have to introduce you to this restaurant," or "You have to try a bite of my dish." So when my friend S invited a gaggle of our friends to lunch at Saveurs, I couldn't refuse. Saveurs redefined my concept of French food- it's not all about foie gras and truffles and crepes, nor about Chef so and so who's famous for what and what. There's so much more to it- and who thought I'd discover that here in Taipei. At first glance, you might dismiss Saveurs as another one of those "Western but local" restaurants with its simple and unassuming (almost hidden) storefront and decor, or for its lunch set menu priced at NT$400. That would definitely be a mistake. French food for US$12? Two pastries at Paul would cost you more than that, but here you'd get not just a main dish, but also a set complete with soup, salad and dessert. How good could it be, I thought? As soon as I tasted dish after dish, I couldn't believe the deal we were getting. I would much rather eat dazzling food in ordinary decor than eat ordinary food in dazzling decor. I'm sure most of you would agree. 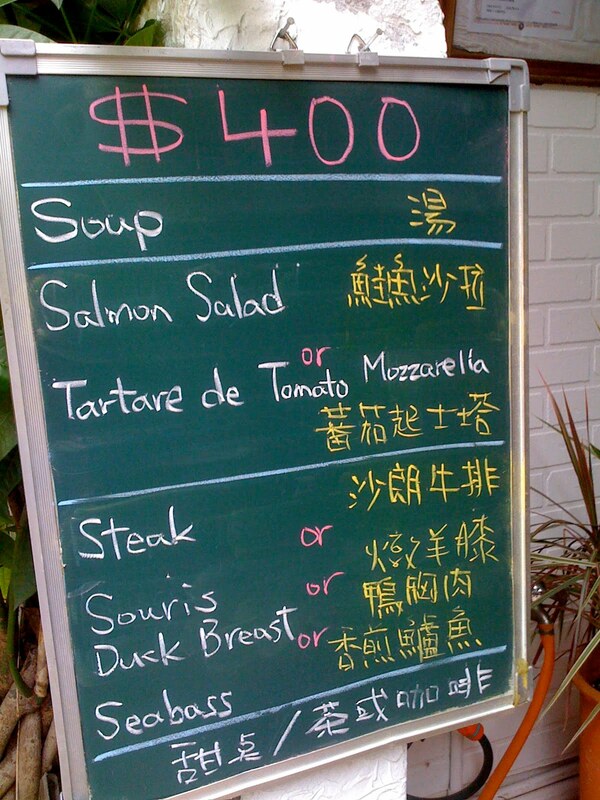 If you missed the sign in the front of the day's specials, the waiter rushes through them in Chinese. The first time I went, they handed us the menu, but the following times I didn't get one. Everyone is going to get the lunch special deal anyways. Sometimes they are out of duck or a certain dessert, so make your reservation for the earlier part of lunch hour if you have your heart set on something. The sliced french bread is soft and addictive, especially if you smear the butter or tapenade on it. The set appetizers can be upgraded to other appetizers- my friend got escargot (seemingly bathed in pesto) and I mistakenly upgraded to the tuna nicoise salad. I thought when he said tuna in Chinese that he meant that salad, when in fact it was a tuna tartar appetizer. The soup is always the same, my friend lamented- but I didn't mind. The carrot soup is the perfect consistency and light. Soon the main dishes come streaming out- our plates of duck, steak, and souris (or braised lamb shank) bathing in different sauce, with a few broccoli florets and a dense serving of baked potato gratin. I could not believe we were getting these portions for NT$400. I expected small, fancy restaurant portions, but we got hearty, rustic sized plates. I was giddy with excitement with the number of fat slices of duck I had. Then I could not stop eating my dish. The staple of Saveurs, for me, are the sauces. I couldn't quite pinpoint the flavors, but they were sweet, savory and brought out the flavors of the various meats. Okay, yes the duck and lamb shank are perfectly tender and hearty, but the sauce I wanted to lick clean off the plate. Seriously. Those with a lighter appetite can opt for the fish, but I had a bite of my friend's lamb shank and resolved to order that on my next visit. In truth, I wish I could eat both dishes at the same time. Bring good friends that will share. Look at the size of this! For NT$400!! And then come the wonderful desserts. All of them are equally mouthwatering, but I have to admit my heart belongs to the chocolate moellux- it's like a chocolate cupcake with crack- spongy soft cake with hints of dark chocolate, brownie like top, warm molten lava center. It's a good size too, unlike some places where it's mini sized and gone in two bites. If you're not a fan of chocolate, there's something for everyone from least sweet to most- an airy cloud of meringue with floating on vanilla sauce, apple tart, crackly creme brulee. I'd never seen *just* meringue served- usually it's something more flavorful like lemon pie, but it was an interesting texture by itself. I've had a few disappointing experiences at restaurants where they were famous for the chef that founded them- yet most likely my meal wasn't made by so and so chef so they didn't live up to the hype and expectations. But at this nondescript little restaurant, I had one of the most unexpectedly wonderful meals by a chef whose name I wouldn't know if I didn't look him up on the internet, who isn't famous. But he should be. Thanks Chef Patrick Cabirol. Even my grandma loved the food! Dinner sets run from NT$550-$1100 and advance reservations are strongly recommended. Each time I went to the 25+ seat restaurant it was packed with couples and groups equally enjoying their food. I'm glad Saveurs won favorite French restaurant in the hungryintaipei reader's poll this year, but hopefully I can still get a seat the next time I want to go! Wow, what a great deal! I just had some great French food last night, but it costs a lot more.. Very cool discovery! I like these small intimate type western eateries around Taipei. Sadly I always stick to local food whenever I visit and never get to try places like those. I really enjoyed the food there (and I'm French, so I'm very picky when it comes to French food). The moelleux au chocolat was really marvelous, and I didn't try what you call meringue and what we call in French île flottante ("floating island" :)), but I love this just because of the crème anglaise ("English cream", don't ask me why) that's under... yum! Hungry girl, I hate you: I'm hungry again! kirbie: it's just a great value at lunch. there's lots of pricey french food here too. pierre: it's nice to hear that the chef is nice! i've never been to france, so i can only compare it to my other restaurant experiences. i'd love to hear about other restaurants that have your stamp of approval! Mmm the chocolate molleux looks like heaven. I am going there this Friday for lunch...can't wait!! no i didn't make it there :/ but i am planning to go once my midterms are over, in 2 weeks! kung food panda: cool! not a typical stop for tourists, but a good break from all the chinese food! i finally got the chance to go today! instead of carrot soup, we had cauliflower soup. i tried the moelleux...ah so divine. the seabass was very, very good. it was doused in a peppery carrot sauce. for dessert, i ordered coffee mousse for myself while my friends had the moelleux and creme brulee. this is definitely going on my 'eat again' list! oh awesome!!! thanks for this one! as always... keep up the good work on the blog! moving back for good soon... have a whole LIST of places to try now! Hi Joanh, i chanced upon your blog from googling 'cheap and good food in Taipei'! It's awesome!! Love your blog and i am 'following' your blog now. Thank you for commenting! Hope you had a great holiday! Hope you had a great trip to Taipei and made it to Saveurs!